Enjoy quick and energy-efficient drying with the WTVC833PUS, which is one of the quietest models of dryers that Bosch has come out with. See the list of key features below and some pros and cons according to consumers. - The unit comes with a 6.7 cubic feet capacity and 15 drying cycles for custom drying of any kind of load. - The dryer also comes with the EcoAction option that reduces energy usage by up to 10%. - The Dynamic Air option is one of the best features for drying with moderate heat and high air. - You can also dry delicates with no heat using the Air Fluff/No Heat cycle, perfect for fragile fabric types and comforters. - Another added feature is the Wool Cycle, which makes drying wool clothing and delicates easy. - The steam options are also very useful. The Steam Refresh cycle refreshes loads that have been sitting in the drum to give you fresh-smelling loads as well as remove wrinkles in as short as 12-16 minutes. 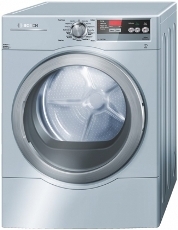 - The unit also comes with the SynchroTechnology, which allows you to synchronize the dryer cycle and the washer spin. - The ActiveWear Cycle is good for washing athletic gear, while the Dark Color cycle is perfect for washing dark colored clothes without the risk of damaging and fading the colors. - The unit comes with the three-way venting system for easy installation, allowing you to install vents though the bottom, the back, or the right side. - The Extended WrinkleBlock option tumbles the load for up to one hour to remove wrinkles from the load. - The dryer is equipped with a stainless steel drum that is able to withstand faster spin cycles compared to units with plastic or porcelain drums. - The reversible door handles allow for easy opening and closing. Most users like the lint filter indicator, which tells them if the lint is full or clogged. Clogged filters can clog up the drainage tubing and interfere with the operation of the dryer. The interior light is an added bonus. Sometimes, getting something out of the dryer in a hurry can be made more difficult if there is no light inside. The interior light is perfect when looking for that missing sock. One of the main complaints with this model is that it cannot tolerate spinning large, bulky pieces of fabric such as comforters and thick jackets. The electronic display panel is flimsy--it is the first one to go, followed by the lint filter, which tends to clog up often.